Sapala was my foundation mare and I never forget the first time saw her. It was in 1985 when Mats Axelsson and I went down to Beit El Kheil Arabians with the mare Wierzba (Erystawi x Wiewiorka) to the stallion Karnawal (Etap x Kasta). Sapala was a yearling and she was standing in her stall looking at us with her huge black eyes, so extremely feminine and precious. I fell in love instantly with her and was not surprised at all when I heard that she was by my favourite stallion Cadyk (El Paso x Cumparsita). Little would I know that I two years later would be working at Beit El Kheil Arabians and in 1991 when I was about to buy my first mare I was offered to buy this amazing mare, something I will be forever grateful for. Thank you Åsa and Erik Melander! I broke Sapala to ride when she was 8 years old and her first offspring bred by me was the colt Siniak in 1993. She had a colt at Beit El Kheil in 1989, Sapaso, and he ended up not far from where I live and his owner Carina still enjoys him and is competing in western. 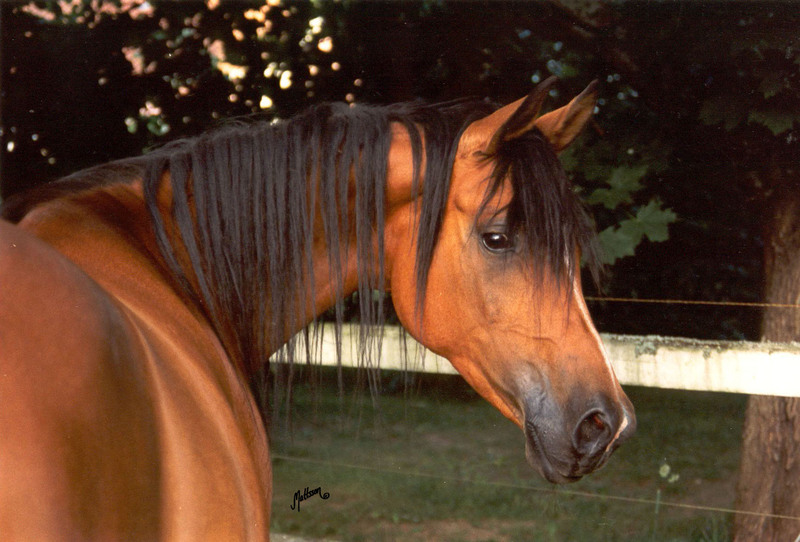 Sapala´s sire Cadyk was a bay son of El Paso – 1976 US National Champion Stallion. El Paso is also the sire of Wizja – 1977 US National Champion Mare; Europejczyk – Polish Race Horse of the Year and 1988 Polish National Champion Stallion and Etogram – 1994 Polish National Champion Stallion, 1994 Babolna International Champion Stallion, 1996 Norwegian and Swedish National Champion Stallion. El Paso was the best son of Czort, the most widely used son of Wielki Szlem (Ofir x Elegantka). Czort was himself a great racehorse with 19 races during 4 seasons, placed first 13 times and second 6 times including winner twice of the Kriterium and second placed in the Derby. El Paso raced for two seasons also with 19 starts (3-3-3-3) and even though he was not as great racehorse as his sire, his fullbrother Elfur won the Derby and El Paso sired several great race horses as Europejczyk (unbeaten at the racetrack, winner of Derby and Kriterium), Filar and Faser. El Paso´s dam was the legendary Ellora (Witraz x Elza), the dam of El Azrak (the sire of Banat), Edessa (the dam of Edjora, granddam of Gazal Al Shaqab), Eliza (dam of stallions Elef and Elimar), Elewacja (first Polish National Champion Mare in 1979), Elektra (dam of the stallion El Ghazi) and the stallion Ellorus. Lasma Arabians in USA wanted to buy El Paso when he returned from the racetrack but the Poles knew his value and said that he was not for sale at any price, and thus the legend of El Paso “the horse that money could not buy” was created. Lasma did however manage to lease him for a period of three years, 1976-1978, during this time he was named Scottsdale and US National Champion Stallion. His daughter Wizja (out of Warmia/Comet) was also leased by Lasma and she was named US National Champion Mare in 1977. Cadyk´s dam Cumparsita is by Gwarny out of Carmen, the dam of the legendary Comet. Cadyk raced for six years at the racetrack in Warsaw before he was imported to Sweden. He was shown here four times with four class-wins, four Gold medal and three Championships including 1983 Swedish National Champion Stallion. Cadyk was exported to USA in 1983 together with his daughter El Mokka after just two breeding seasons. Sapala´s damline traces down to the incomparable mare Saga and her daughter Sakla by Amurath Sahib. The full-sisters Sakla and Estokada made their own dynasties in Sweden and Poland respectively with extraordinary horses like Emigrantka, Estebna, Medalj, Salexja, Magora and Esklawa. Sapala´s dam Saldara is a daughter of the Swedish National Champion Stallion Dardir (Nabor x Darda) and out of the Algier-daughter Salamalaika, one of the foundation mares of Beit El Kheil Arabians (later SalEx Arabians). Salamalaika was out of the beautiful fleabitten mare Salexja (Exelsjor x Sake), the dam of 8 foals at Blommeröd before she was sold to Aries Arabians in USA. Although Salexja did not get many foals, her daughters Polka (by Pohaniec) and Sagana (by Engano) made a great impact with Polka as the dam of the stallions Polak (by Engano) exported to USA and Primo (by Engano), Swedish National Champion Stallion and chiefsire at Janów Podlaski in 1998-1999 while Sagana is the dam of the great mares Sadza (by Rusazcie), Prosba (by Probat) and Szansa (by Rusazcie), all three Swedish National Champions and Sadza is in her turn the dam to World Champion Medalj (by Menes). Saldara is also the dam of Saleta – 1988 Swedish National Junior Champion Mare and Sargasso – 1998 Swedish National Reserve Junior Champion Stallion.